Did you know that auto insurance companies reward you with cheap insurance quotes after you install high-quality Car Anti Theft Devices? They do this because you’ve taken direct measures to lower the risk of auto theft. In addition to paying cheap auto insurance quotes, you also enjoy peaceful nights because high-quality Auto anti theft devices protect both your car and any personal belongings stored inside. 2. Get these Vehicle anti theft prevention devices today! A good car alarm system prevents burglaries because the loud siren goes off whenever a burglar tries to smash your car windows. It actually comes in handy when you’ve parked your car in malls or busy shopping centers with open parking lots. These areas attract car burglars and thieves because it’s easy to lurk around without drawing attention. A two-way car alarm system enables you to send and receive signals to and from your motor vehicle. Nowadays, you’ll come across high-end car alarm systems that feature a smartphone app. It notifies you whenever someone tries to breach your car’s perimeter by touching the windows or using a fake key to gain entry. Car tires and rims are always in high demand all year round. Shady car accessory shops rely on car burglars to sell stolen tires and rims at throwaway prices, in order to make huge profit margins. If you’ve just bought a new car, you probably have no idea how many car thieves in your neighborhood are plotting on your brand new tires. How does a tire lock work? It consists of two hook-like metal parts facing each other. You clamp each side on the outer and inner side of your car tire and lock with a special key. When correctly fitted, a tire lock prevents any rotations. Tire locks are great because good quality ones made from tough metal alloys are virtually unbreakable. Any thief who tries to break one will most likely get caught because of the noise generated while striking your tire lock. It also compliments your car alarm system because hitting the tire lock with a crowbar automatically triggers your alarm. Car burglars love stealing car batteries because they have high demand and fetch good prices in the black market. In some very unsafe neighborhoods, some car owners have to uninstall batteries and lock them inside their houses when leaving their cars parked outside overnight. This is an unsafe car anti theft strategy because battery acid causes chemical burns when it encounters human skin. A hood lock works by immobilizing the levers under your hood that facilitate opening and locking. Once activated, you can only release it by pressing the lever in your steering column. Car thieves hate hood locks because one cannot break them without drawing lots of attention. Since security is your top priority, it’s advisable to purchase hood locks produced by auto manufacturers. If you have a Ford Mustang, make sure you buy your hood locks from official Ford auto dealerships. Are you planning to pimp your ride by getting a brand new set of chrome rims? That’s good because chrome rims enhance your first-impression when you pull up at a party or meeting potential clients. Truth is, chrome rims are expensive and that’s why car thieves like them. You can safeguard your chrome rims by purchasing a set of chrome wheel locks. A chrome wheel lock works by blocking access between a thief’s tire spanner and your wheel nuts. You use a special tire spanner to lock fit a chrome wheel lock on any wheel nut. Since a chrome wheel lock set has four lug nuts, you’ll use one lug nut per tire. Why should you protect your car’s steering wheel? Because protecting it hinders a thief from driving away after breaking in and hot-wiring your car. There are two types of steering wheel locks. An electric steering wheel lock comes pre-installed in certain motor vehicles and it works by immobilizing movement when the driver switches of the car. Auto manufacturers install electronic steering wheel locks inside the steering column because they work best when positioned close to the steering shaft. Mechanical steering wheel locks are more common than electric ones due to affordability. It looks like a long selfie stick except that it has two large hooks at the front and another pair near the handle. Mechanical steering wheel locks are manufactured using tough steel alloys to prevent breaking when struck with hard items. A kill switch can protect your car from hardened auto thieves. It’s easy to speed off in a stolen car that lacks steering and tire anti theft locks because you just need to break the steering column and do some hot wiring. How does this work? 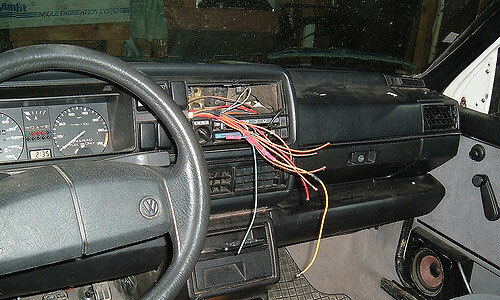 Thieves connect the two wires that transmit electric current to your engine. Then, they hold these wires together by twisting or using masking tape to keep the engine on as they whiz off. A kill switch works by hindering electric current flow to the fuel tank and dashboard. This makes it impossible to start the car because the engine requires an electric current to distribute fuel consistently. Out of the seven Car Anti Theft Devices appearing in this list, this is the only one that can help you track down a stolen car. Despite what you’ve heard about the sophisticated methods auto thieves use to disable GPS tracking systems, you can still use your GPS to track down a car stolen by amateur thieves. Moreover, high-profile auto thieves have to drive the car to a safe place in order to uninstall the anti theft GPS tracking system. If you notify authorities in good time, you can trace your car to the den of robbers fast. Our ancestors always said that prevention is better than cure. While having valid comprehensive auto insurance entitles you to various forms of compensation, one still suffers as a result of burglary or auto theft. For instance, your auto insurance company might compensate you for a laptop stolen through breaking and entering. However, if you were working on an end-of-semester college assignment or a client’s project, it’s up to you to pay for data recovery costs.